This was hands down another favorite experience in my Dessert Tour. It was not easy to dine here just for desserts, but with a little name dropping and knowing one of the sous chefs there, Adam and I were able to get a seat inside L’Atelier’s beautiful restaurant. There is seemingly no bad seat in the house due to the grand, open kitchen that is set as the key viewing point in the restaurant. With this being said we sat at the bar, the closest you can be to the kitchen. 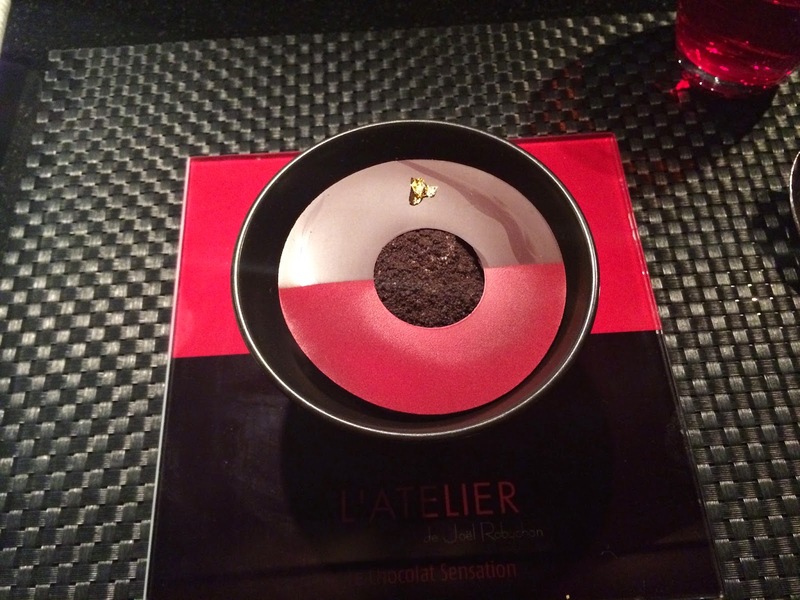 L’Atelier is an award winning restaurant, AAA Four Diamond, Forbes Four Stars, and One Michelin Star. 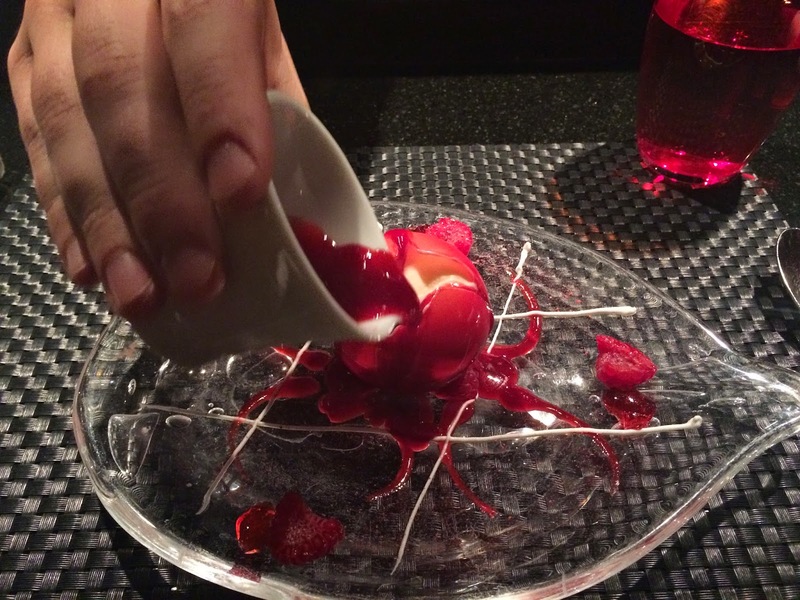 This dining experience was our first One Michelin Star restaurant, so it was very exciting! 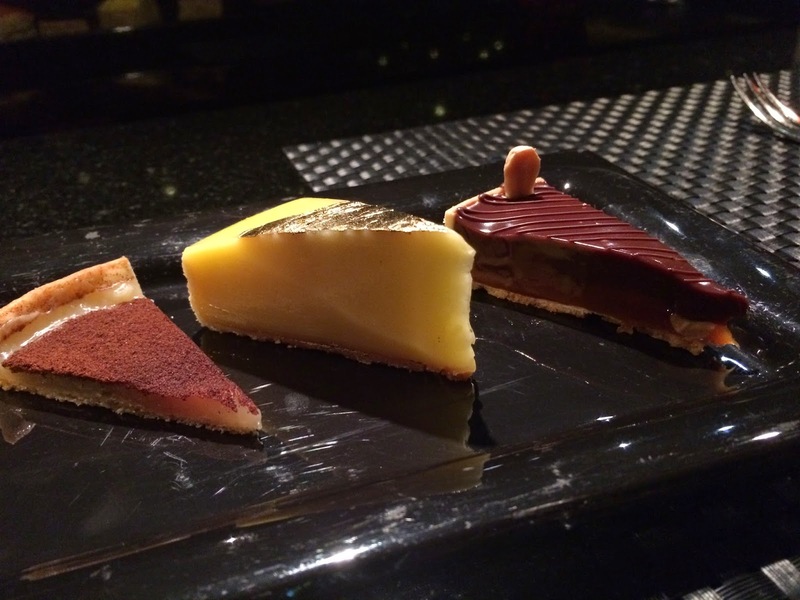 The current pastry chef, Salvatore Martone, has some of the best desserts I have ever had! 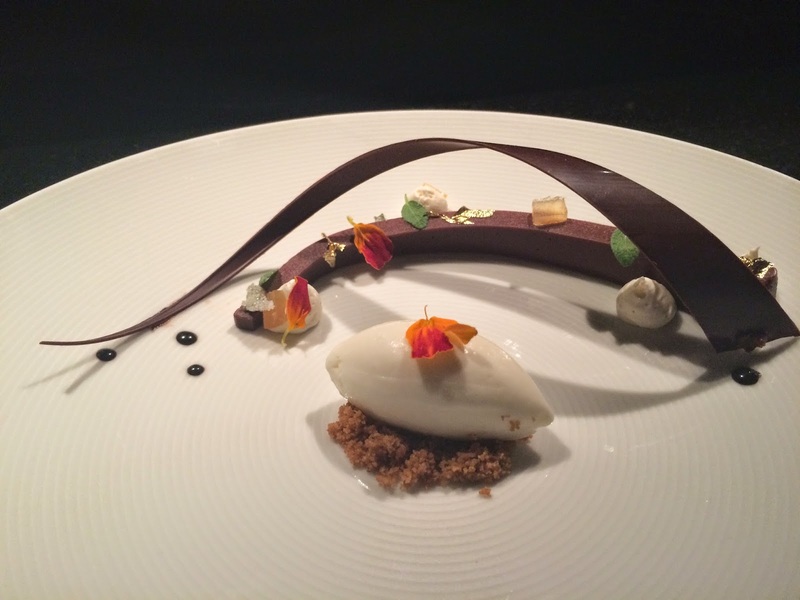 Chef Salvatore has recently been nominated for the 2015 James Beard Foundation’s Outstanding Pastry Chef award. I am not surprised, given his desserts are some of the best I have ever had. The hospitality was generous – the general manager and the executive chef said hello to us. In addition, our server was outstanding! He had recently moved from bartender to server and you would have never known. He was thorough with every dessert as I threw questions at him in regards to the components on each plate. 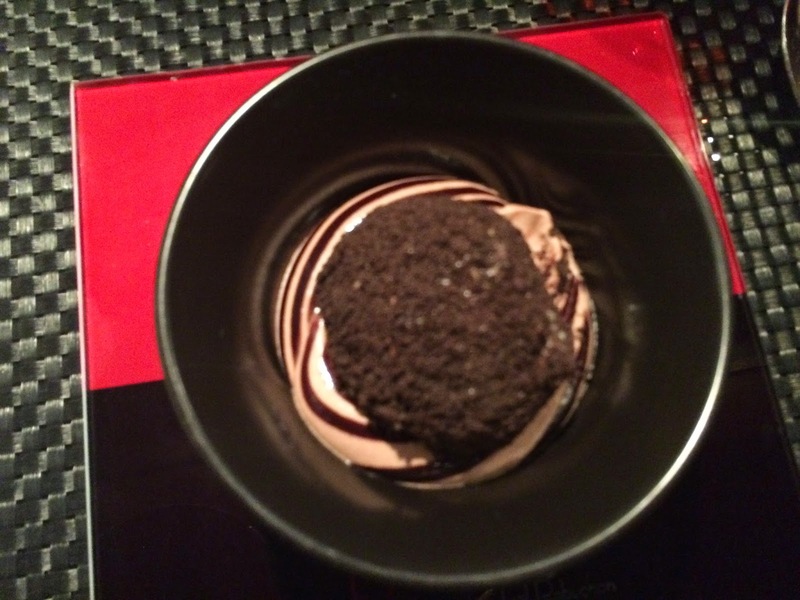 We ordered their famous dessert and Adam ordered a decadent chocolate dessert because he saw that it had Oreo cookie crumbs haha (Oreo’s are his favorite!). I love my simple man. 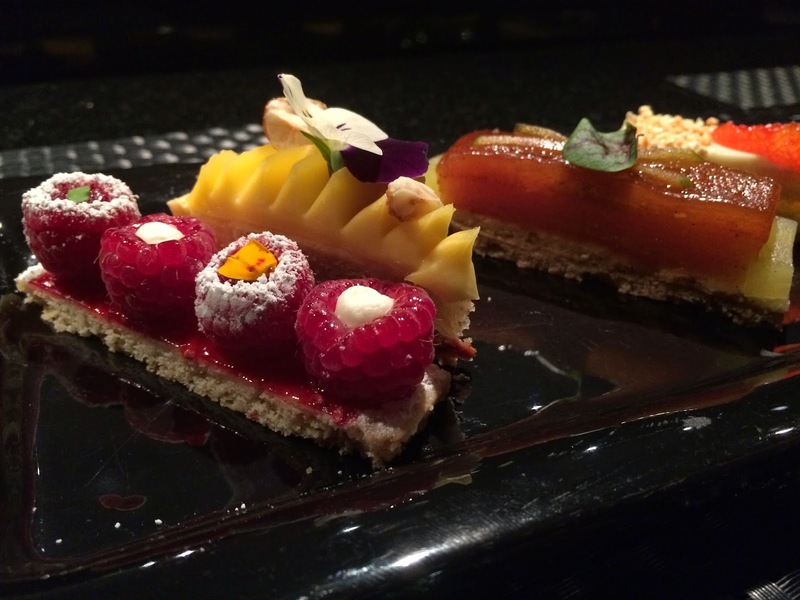 As I had previously stated, L’Atelier’s team was very generous to us, and because I showed so much enthusiasm for pastry arts and wanted to try something from Chef Salvatore, they sent out their two seasonal tasting desserts. We thought that was the end to our experience, but then they brought out their plate of traditional tarts! We are really spoiled sometimes, but we aren’t complaining! Yes I rated this 11/10 because that’s how amazing it was! 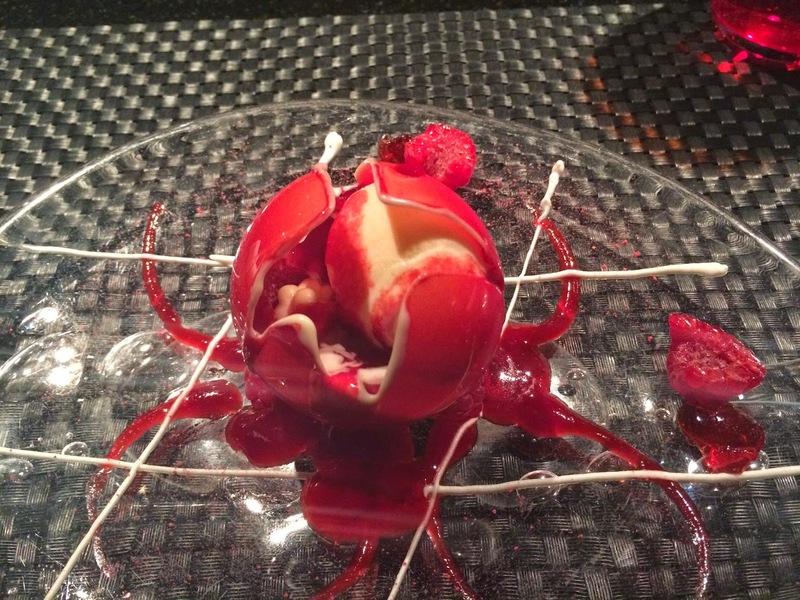 As the description implies, it is a fresh raspberry surprise inside a white chocolate sphere. Besides Adam’s wedding proposal this was the best surprise I’ve ever had! The lemon mascarpone was plated like a tic tac toe board, along with raspberry gelee and fresh raspberries surrounding it. 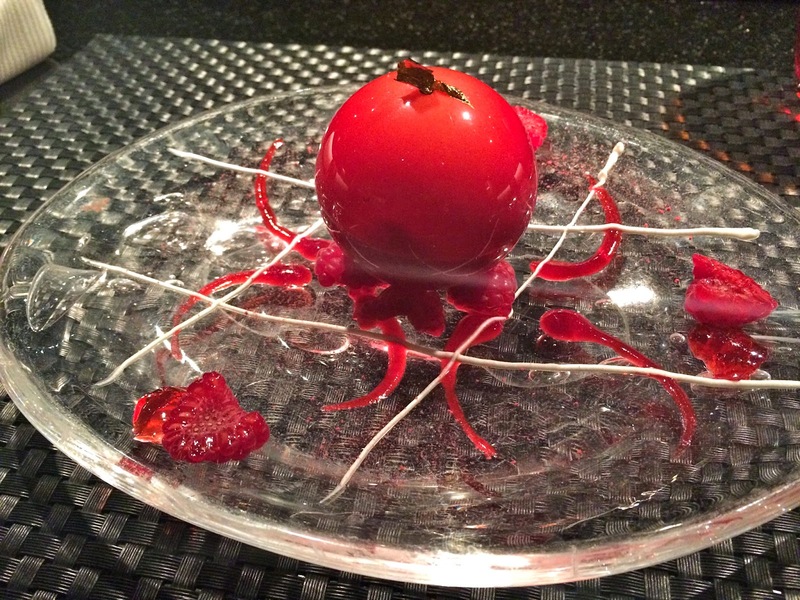 The white chocolate sphere was spray painted a raspberry red color with a gold leaf on top. 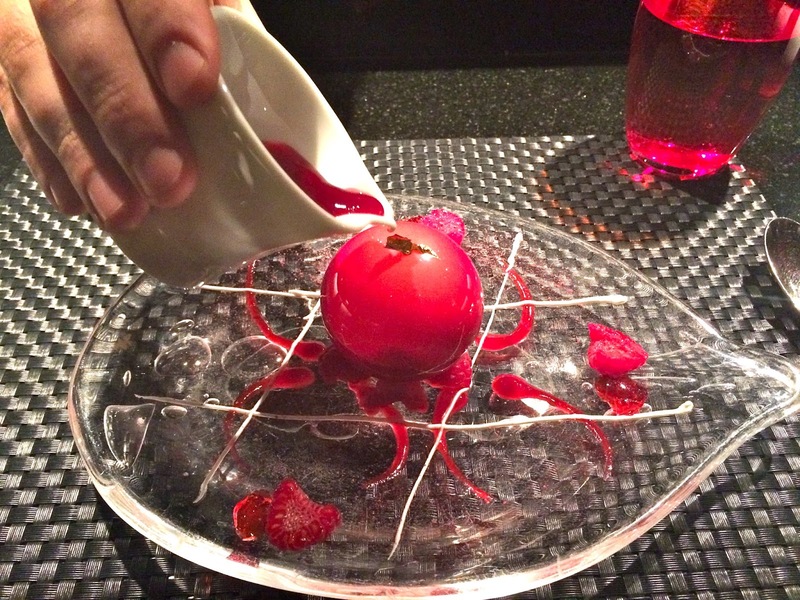 The server poured raspberry sauce on top to break the sphere, which then opened to the lovely surprise of yuzu sorbet and white chocolate pearls. 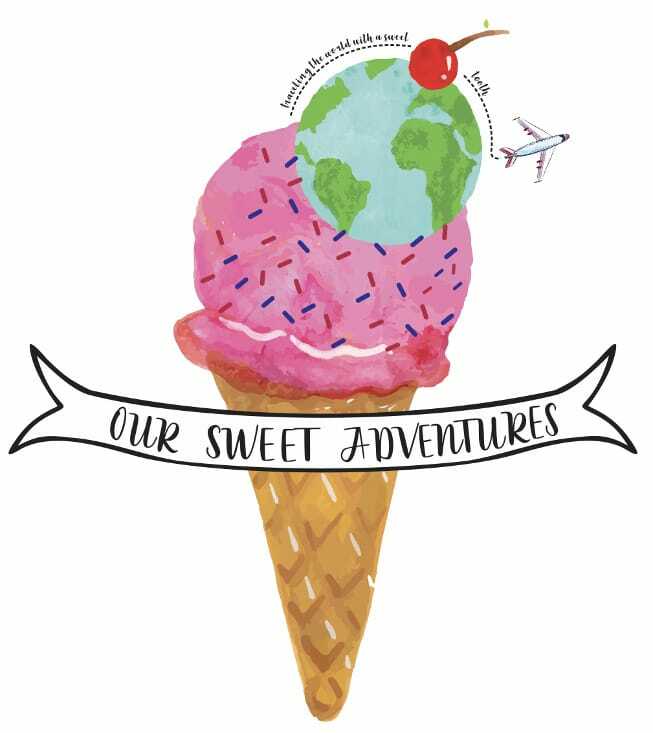 It sounds so simple, but it was actually the contrary – everything was absolutely amazing and refreshing. Overall, it was smooth, acidic, and sweet with a crunchy texture from the white chocolate pearls. A chocolate sensation this is… Araguani (dark) chocolate cremeux, chocolate sauce, white chocolate ice cream, Oreo cookie crumbles and a chocolate disc and golden leaf on top. With all this chocolate you would think it would be heavy and too rich, but that is not the case. It was perfectly balanced with sweetness and luxurious chocolate tones and had lovely textures throughout. This chocolate sensation dessert showcased the distinct and exquisite chocolate flavors that kept the dessert clean without overwhelming it with too many supplementary additions, such as sugar. The bottom layer was Araguani chocolate base, then on top of that was white chocolate ice cream covered in Oreo cookie crumbs, then there was a chocolate cremeux that surrounded the ice cream with chocolate sauce drizzled around it, and finally a chocolate disc on top. Chocolate on chocolate on chocolate on chocolate on chocolate on chocolate! ‘Oh my gosh!’ is what I am pretty sure I exclaimed after my first bite. First of all this dessert is just picturesque. It is also a creative piece by Chef Salvatore, which I am so happy I was able to try something he created. 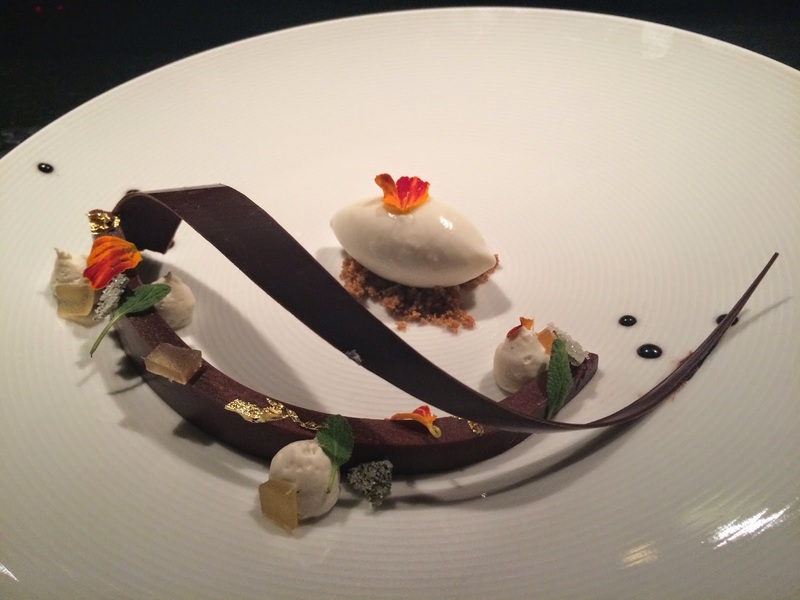 The semicircle was a spiced chocolate cremeux surrounded by candied sage, cubed ginger gelee, small dollops of vanilla panna cotta, gold leafs, and flowers. Ultimately, it was a quenelle of ginger ice cream sitting on top of a graham cracker and sage crumble. The spiced chocolate cremeux alone was silky smooth and melted away in my mouth while I tasted a heavenly combination of spice and sweetness. A bite of all of these components was like fireworks in my mouth due to all the distinct flavors. My taste buds had to work hard to experience every essence. There was candied ginger that had a warm, spicy bite with a hint of sweetness from the coated sugar, candied sage that had woody aromas, and lastly vanilla panna cotta that was creamy and delicious. The flowers and gold leaf were simply for show, so they tasted like nothing haha. The ginger ice cream was excellent, it had a “zing” but is still velvety, just like the candied ginger, and was followed by a nice contrast of texture from the graham cracker and the sage crumble, which overall added more sweetness. All in all this a great fall dessert, but I would enjoy it year round. 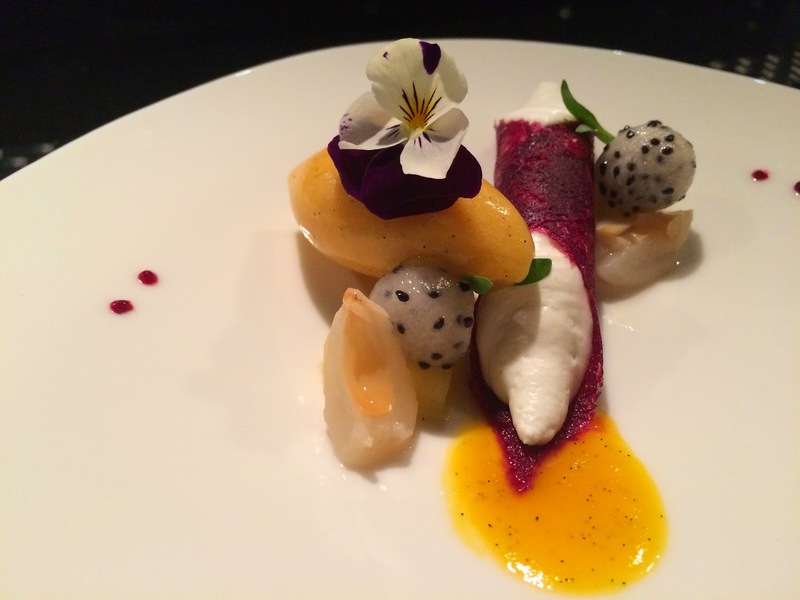 This is another creative dessert by Chef Salvatore that showcases fresh and tangy fruits. 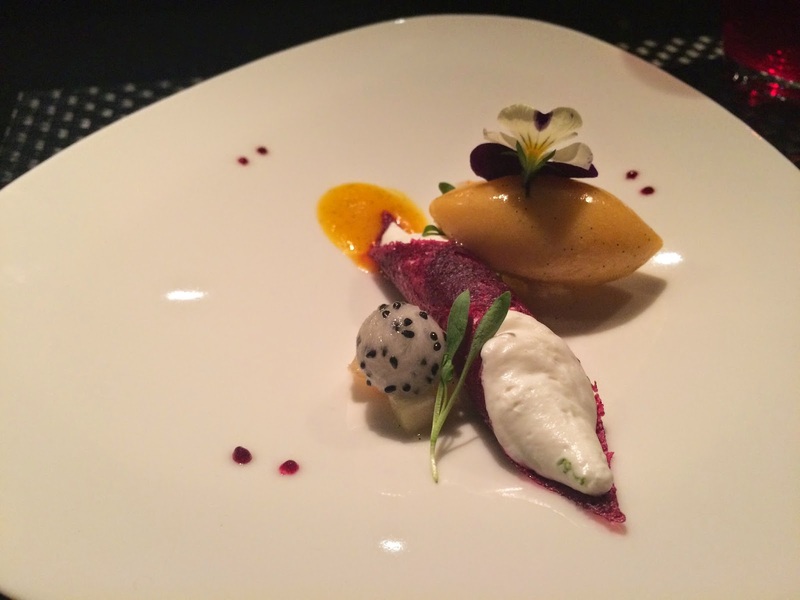 It is lychee mousse inside a thin blackcurrant tuile, with fresh lychee, Caribbean sauce, and sorbet (a combination of passion fruit, pineapple, guava and mango). 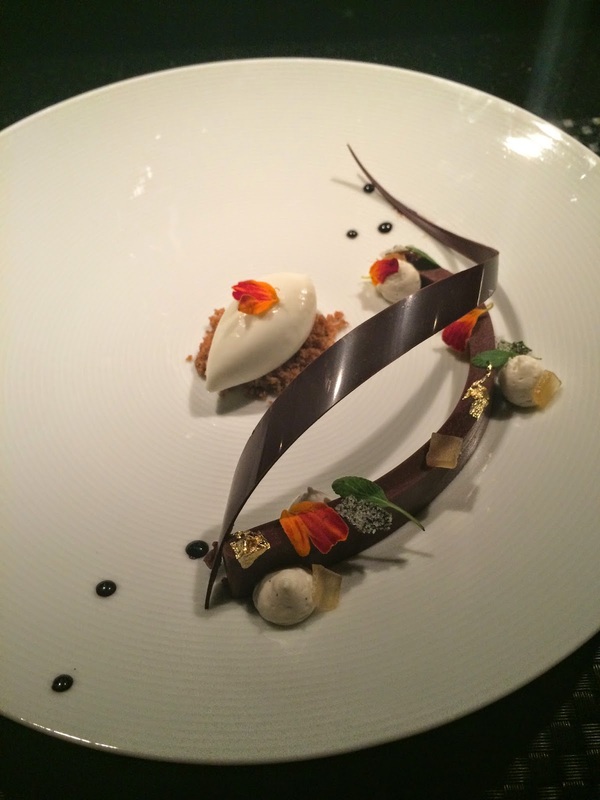 The only thing missing about this dessert was enjoying it on a white sand beach! The dessert was so refreshing and would be the perfect finish to a long dinner. The light, fluffy, silky lychee mousse had a subtle sweetness and was luscious! If a grape and a pear were to have a baby, this would be it. The black currant tuile gave a little contrast of texture from the mousse and was acidic, sweet, and tart like a raspberry. The Caribbean sauce and sorbet were very tropical and balanced perfectly with the acidity, tanginess, and sweetness throughout the dessert. In conclusion, this dessert is clean and simple. 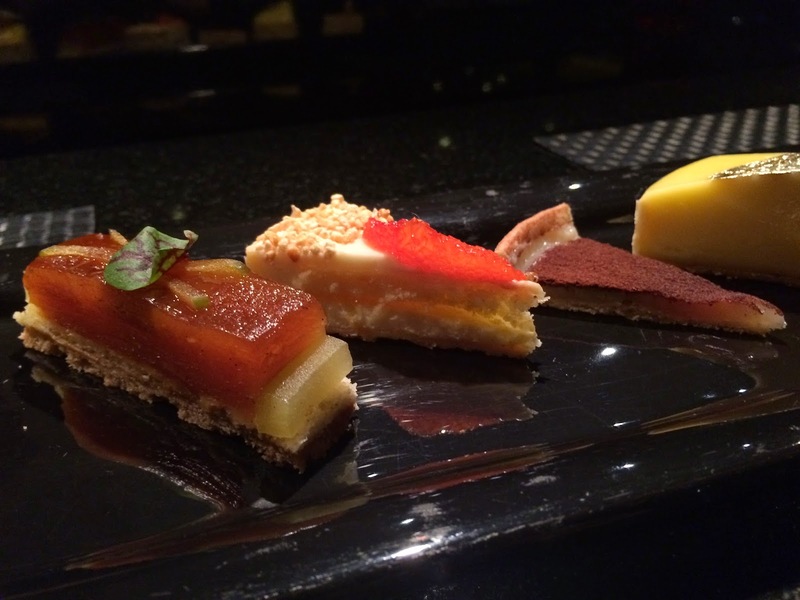 Unbelievable assortment of tarts with different flavors across the plate! Fresh raspberries on a thin piece of shortbread. Tangy and sweet from the raspberries with a nice crunch from the shortbread cookie. I have never had the flavor combination of hazelnuts and passion fruit, but after tonight this will not be my last – loved the flavor combination profile. A crispy and soft hazelnut tart with a zesty passion fruit cream. Soft almond flour tart with a sharp apple gelee. There was no contrast of texture but the apple gelee was delightful. This dessert surprised me the most. I did not expect to love this tart so much based on the description. It was light and airy and had a wonderful and surprising bite from the puff rice. The orange slice on top of the tart added a nice citrus touch, which gave it that much more of a “pop”. Very thin, custard tart with cocoa powder on top. Least favorite. Nothing spectacular and a loss of flavor compared to the other exciting tarts. Amazing! I believe Adam and I were fighting over small bites of this tart. This tart was serene, sweet, and (of course) sour from the lemon. The lemon curd was silky smooth with a little contrast of texture from a very thin layer of crust that was completely divine! This tart was called Snickers, so I thought for sure Adam would love it; however, neither of us thought it was anything special, it was just a basic take on the classic Snickers Bar. It was rich, salty, and sweet.